Summertime is one of the most refreshing times of the year. Everything feels new: the plants, the weather, and your readiness to get outside. One of the best places to spend this time is on your deck. Before summer rolls around, it can be good to get out and give your deck a cleaning in the spirit of the season. Decks become dirty through the fall and winter seasons and may require a little sprucing up before they are ready to be used. A pressure washer is a handy tool to help you do just this. Whether you own your own or rent one, it can make the cleaning process quick and effective. By the end, you can expect to have a spotless deck to enjoy the entire summer on. Read on for the ultimate guide to pressure washing your deck. Technically, you can clean your deck anytime of the year. Anytime you clean it you can restore it to its natural beauty. However, there are several important things to think about before you begin. Finding the best time to clean the deck is one of the most important things. If you decide to clean the deck during the fall or winter, you can expect all of your hard work to be undone over time. During these seasons, debris from leaves, dust, and pollen get all over outdoor surfaces. In the wintertime, dirt and mud often mix with snow to become a muddy mess. Most decks become dirty over the year during these periods. You can save some headaches by waiting until the main dirty season is over before you begin to clean the deck. Waiting until summer is possible. All the dirt and grime from the previous seasons should be over at this point, but you might lose out on prime outdoor living if you wait too long. Washing a deck in the heat can also be a harsh experience. Instead, the most prime time to wash your deck is in the spring. When the plants and trees are beginning to bloom and you have already done all your yard work, you can turn your attention to the deck. Wait towards the end of spring in order to avoid last minute snow showers. A pressure washer is a handy tool to use for any outdoor surface cleaning. It’s powerful, quick, and does a great job. It also requires a bit of setup to use correctly. Before you turn your attention to the pressure washer itself, it’s important to prepare the thing you are about to clean. The high pressure of the water can damage unprepared surfaces and surrounding objects. It’s important to clear and prepare the space to avoid this damage. Start by clearing off all the furniture and objects on the deck. Even though most outdoor furniture can withstand a typical rainstorm, the high-pressure can strip off paint and stains, and damage woods and composites. Older furniture is particularly at risk. You can put all the furniture off to the side in your yard. Make sure there’s enough space in between your furniture and the deck before you move on. Next, close any windows and doors that are near the deck. It’s possible to spray the water stream directly into open doors and windows or have after spray seep through. The water can damage interior spaces and furniture if you are careful. You should also cover any plants, trees, and bushes that happen to be near the deck. Foliage is fragile to high water pressure which can damage or even kill small plants and bushes. Finally, give the deck one last look over for large debris. Twigs, sticks, rocks, and other large objects can damage the deck as they are swept away by the water. You can even take a broom to the deck before cleaning it off. 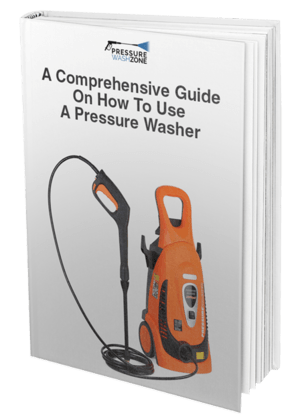 A pressure washer is fairly easy to prepare and use. The setup process will differ slightly depending on if you have an electric or gas washer, but most of the steps remain the same. You will have to hook everything up, prepare the water, and turn it on. Start by assembling all the parts together. You will want to attach the water supply to the motor and/or nozzle with the supplied hoses. Make sure these hoses are connected tightly so there isn’t a loss of air pressure when you turn it on. You should also set the nozzle to a low-pressure setting to prevent it from kicking back and flying out of your hands. If you have an electric washer, find an outdoor plug to supply power. Connect a long extension cord to the washer and then to the power outlet. Make sure the extension cord is away from any potential obstacles like surrounding trees, wood posts, or furniture. If you have a gas washer, fill up the gas engine. Be careful not to spill any gasoline onto the deck or grass. Finally, attach the supplied tip to the nozzle. This tip will focus the stream of water as you begin to wash the deck. This also helps to create the pressure the washer needs to clear the deck of debris. Once you have the washer ready, turn it on. An electric washer will have a switch. For a gas washer, you will have to pull the cord a few times to rev it up like a lawnmower. You should now be ready to clean your deck. Using a pressure washer is a fun and exhilarating experience. It can also be potentially dangerous if used incorrectly. Keep safety at the top of your priority list. If you have other people around, especially small children, make sure they are clear of the deck space before you begin to wash. You can also wear safety clothing like protective glasses and gloves to keep yourself safe. While you are using the pressure washer, avoid directly hitting anything fragile. Things like windows can easily break under the high water pressure. Once you’ve turned the pressure washer on, start by pointing the nozzle towards the deck. You will want to keep the nozzle at a 45° angle from the floor. Gently squeeze the trigger to begin the spray. You might have to adjust the pressure on the nozzle to get a good and consistent stream of water. You don’t want the stream to be too weak or too strong. As the spray begins, move the nozzle from side to side in a swaying motion. It’s important to keep the nozzle moving for the best coverage. You can move around in gentle arcs that overlap to make sure you cover every area of the deck thoroughly. At this point, cleaning the deck is a simple matter of washing each space with water. Try to work away from the center or the side of the house the deck touches. You should wash away the debris towards the edges of the deck near the yard. This will ensure any dust and debris from the deck won’t dirty up any other part of the yard except the grass. While you’re walking around on the deck, you can try to avoid stepping on the clean spots until the last minute. 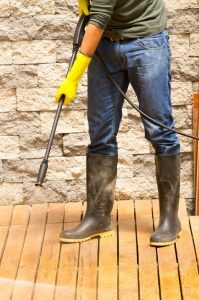 If this isn’t possible, you should wear relatively clean shoes to avoid creating dirty footprints on the clean surfaces of the deck. It can be easy to undo some of the cleaning you’ve just done, so be careful with where you step as you clean. The entire process should be relatively quick from start to finish. Depending on the size of your deck, the pressure washer will provide enough coverage to wash each area as you move around. You can also revisit certain areas if a single pass isn’t enough for particular trouble spots on the deck’s surface. Once you’re done, you should turn off the pressure washer, unplug it if it’s an electric washer, empty out the water supply, and disassemble everything. Let the deck dry for a while before you move furniture back into place. Now you’re ready to enjoy a nice clean deck for the summertime. If it’s the right time to clean your deck, there’s no time to act like the present. Don’t hesitate to bust a pressure washer out and to start cleaning. The sooner you do it, the sooner you can enjoy a nice clean outdoor space for the summertime. You can also clean your deck before doing any outside work, maintenance, or construction. For example, it is recommended to give the deck a good power washing before painting and staining its surface. A pressure washer can be an easy and effective means to clean your deck. With a little bit of preparation and safety, it is one of the best ways to recover the natural beauty of your deck. For more information or equipment reviews, feel free to get in touch or check out the rest of the blog.